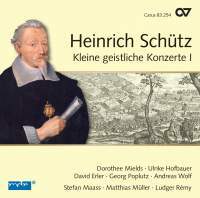 The seventh volume of Carus-Verlag’s complete works of Heinrich Schütz, recordings based on their printed edition, makes no mention among the performers of Hans-Christoph Rademann, the director of the ensemble in previous issues, but he is pictured as the artistic director of the project. Carus-Verlag took over the Stuttgart edition of the printed complete works in 1992, and its website lists 18 volumes of the familiar published works and five volumes of separate pieces, even those with uncertain attributions. For this issue, Ludger Rémy writes a personal note, admitting that as a Catholic he found the music of Schütz alien and stern before he came to understand the times. The 1630s saw Germany as a battleground of the Thirty Years’ War under the guns of Protestant Sweden and Catholic France and the Empire. Schütz had no forces to perform elaborate music such as the Psalms of David, so he had to write for a few voices and continuo. These two volumes appeared in 1636 and 1639, but the composer endowed them with everything he had to create music for worship. This is the fifth complete set of the music published as op. 8 in 1636. The first set came from Wilhelm Ehmann, at the time highly admired for his stylistic excellence, issued on both Nonesuch and Musical Heritage Society LPs (more recently on Cantate CDs). He was followed by Gerhard Schmidt-Gaden (Fanfare 13:6), Manfred Cordes (24:1), and Matteo Messori (30:5). All four of these sets were recorded together with the second set of Kleine geistliche Konzerte, op. 9, but we can be sure that Carus will also bring out the second book soon enough. All the sets have been sung by adult mixed voices except Schmidt-Gaden’s boys and men, and one voice to a part except for the optional small chorus at the climax of the last two works in Ehmann’s set. The first four followed the published order, so Carus is the first set to avoid what might be seen as the monotony of four solo works together, 11 duets together, four trios, four quartets, and a final quintet as they occur in the published order. (A similar decision must be made in recording Geistliche Chormusik, an extreme example of how varied the choices can be, as detailed in 31:5.) All used similar continuo accompaniment except Messori, and he omitted it only in six of the 24 pieces. The most notable difference is the choice of tempos, each succeeding set faster than its predecessors by a total of at least several minutes. The times range from Ehmann’s 91 minutes to Carus’s 71 minutes. Hence, apart from tempo, there is less difference among the five recordings than we find in some other published collections of the composer. Each in turn was welcomed on its merits, even if Cordes is clearly the main competitor to the new offering. In comparing these two conductors in another set (31:2), I expressed a clear preference for Rademann. There is much less difference between the two this time, though Rémy’s ensemble produces brighter interpretations with its faster tempos. The voices are comparably fine, so if you have Cordes already you may choose to skip this entry in the Carus set. A new purchaser will note that this is the first op. 8 on a single disc, since it is the first one fast enough to fit on one. It is a fine continuation of the Carus series.